Some of the information on this page is now outdated and is kept for historical purposes. Physical Employment Standards (PES), aka Role Fitness Test (RFT) here. The British Army encourages its commanders to use physical fitness assessment/test results as performance indicators. However, the British Army argues that care must be taken to ensure that physical fitness is developed in a balanced way. Also unit physical training programmes must emphasise the development of combat fitness, the prevention of ill-health and the promotion of health, and are not to be specifically designed for the soldiers to pass the assessments or tests. Inspections: used to evaluate training procedures, the effectiveness of a unit’s physical training policy and its physical training programme. Observation: by observing training in barracks, or on exercise, any reduction in physical ability/fitness may be identified and corrective action taken. For example, modifying a physical training programme to improve upper-body strength. Medical Examinations: assist in the identification of personnel with health related problems or disabilities who may benefit from participation in rehabilitation or remedial training programmes. 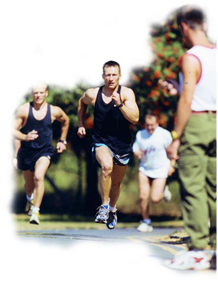 In order to provide military fitness instructors with detailed information on the conduct of the physical fitness assessments and tests the four branches of the armed forces each produce, in some form, ‘Fit to Fight’ policy and procedures. These policies and procedures provide detailed information on the conduct of the various physical fitness assessments and tests to ensure that they are carried out in a professional, consistent and safe manner by appropriately qualified personnel. Although the armed forces have several different fitness assessments and tests, training providers typically utilise, either a direct or hybrid form of, the basic personal fitness assessment (BPFA) currently in use by the British Army. An outline of the various fitness assessments and tests is given later. Assessment of individual fitness should be performed on a regular basis and convention suggests at the beginning and end of training so that meaningful comparisons can be made and improvements quantified. If training is over a longer period then testing in the middle of the training programme will also be useful (ASPT, 2001). This information is important in determining the effectiveness of the training programme and can be used to revise the training objectives and the physical training programme. Assessments conducted too frequently are unlikely to be true indicators of programme effectiveness and may be counter-productive by alienating individuals. The publication of test results, via email or social networking sites, can also be a powerful motivational tool. For training providers in the outdoor fitness, fitness boot camp and military fitness market, the purpose of the fitness assessment is to provide new and current members, plus the fitness instructor, with an indication of the individual member’s current level of fitness. As fitness is a relative term and has no absolute value, the fitness assessment provides a snapshot of an individual’s fitness for that particular moment only. However, several snapshots over a period over time can be useful to gauge progression. Table 1 provides a brief overview of the fitness assessments and tests currently utilised by the four branches of the British armed forces. Known as the: BPFA in the British Army; as the Royal Navy Fitness Test (RNFT) in the Royal Navy; as the RAF Fitness Test (RAFFT) in the Royal Air Force; and as the Royal Marines Battle Fitness Test in the Royal Marines. One minute for both press-ups and sit-ups in the RAF. The Rockport Walk is a ‘sub-maximal’ test that predicts stamina levels and it involves a best effort walk of one mile. As most training providers utilise, in some form, the British Army’s fitness assessment to measure the progress of their members we shall now look at the fitness assessment and other tests employed by the British Army in greater detail. The prevention of ill health. Aerobic Fitness (Run or Multi-Stage Fitness Test (MSFT)). The MSFT is often referred to as the ‘Bleep Test’ and is only used as an alternative to the run in situations where it is not possible, for logistical, geographical and/or security reasons, to conduct a run. Green or ‘Good’: personnel achieving a minimum total score of 210 points, with a minimum of 70 points achieved in each activity, are classified as ‘Good’. This is the minimum acceptable level of personal fitness and those achieving this standard are deemed as being physically capable of undertaking more progressive physical training without need for additional personal training. Amber or ‘Fair’: personnel achieving a minimum total score of 210 points, but who only score from 60-69 points on one or two activities, are classified as being within the ‘Fair’ category. This indicates that the individual has a weakness and needs specific remedial physical training prescribed for that particular area. Medical advice should be sought whenever doubt exists as to the cause of the weakness. Red or ‘Weak’: personnel achieving a total score under 210 points, or less than 60 points in any one activity, are classified as ‘Weak’. It is strongly recommended that the individual receives specific remedial physical training and may, additionally, require medical referral. The purpose of adopting a colour-coded scoring scheme is to provide a method of assessment which is sensitive to changes in personal fitness, offer commanders an easily identifiable ‘snap-shot’ of the unit’s fitness standards and encourage individuals to progressively increase their score. The individual lies flat on the stomach/chest with legs straight, the feet not more than 30cms apart and the hands positioned under the shoulders. Ensure that the hands and feet are on the same level, either both on the mat or both on the floor. The press-up is performed by straightening the arms, until they are fully locked at the elbows, using the toes as a pivot. The body is then lowered until the upper arms are at least parallel to the floor. The body must be kept straight throughout (see picture right). 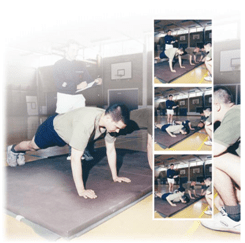 Press-ups are performed for a period of two minutes or until the individual can no longer continue due to the onset of fatigue. However, rest periods are permitted provided that the correct rest position (on both knees, with hands stationary) is adopted. The aim of this assessment is to assess the muscular endurance of the muscles of the chest and shoulder girdle. Table 2 highlights the number of press-ups to be performed in two minutes to achieve the various categories. The individual lies in a supine position on a mat with his/her knees bent between 70/110 degrees and the feet not more than 8 cm apart. The arms are folded across the chest with the finger tips placed in the depression above the clavicle, close to the shoulder and must be maintained in this position throughout the duration of the assessment. The scorer holds the feet in place. The sit-up is initiated by curling up to reach the vertical position, followed by a return to the starting position, ensuring that the shoulder blades gently touch the floor (see picture right). Sit-ups are performed for a period of two minutes, or until the performer can no longer continue due to the onset of fatigue. However, rest periods are permitted provided that the correct rest position is adopted (lying flat, knees bent and scorer holding the feet in place). The aim of this assessment is to assess the muscular endurance of the abdominal and hip-flexor muscles. Performers are not allowed to bounce their back off the floor to gain assistance or momentum. Table 3 shows the number of sit-ups to be performed in two minutes to achieve the various categories. Part two follows on immediately after Part one and is a timed, best effort run over a measured distance of 2.4km. The aim of this assessment is to assess aerobic fitness. It is permitted to pace during the run as long as there is no physical contact with the paced individual and the pacer does not physically hinder others taking the assessment. The practice of running ahead of, alongside of, or behind an individual who is being tested, while serving as a pacer is, therefore, permitted. Cheering or calling out the elapsed time is also permitted. Table 4 shows the time required to achieve the following categories on Part 2 (2.4km) of the run. The Multi Stage Fitness Test (MSFT) is only used in situations where it is not possible for logistical, geographical and/or security reasons to conduct the run assessment. The assessment involves running between two lines set exactly 20m apart (a lap) while keeping up with a series of bleeps from an audio cassette or CD player. The bleeps start off at a slow jogging pace and progressively increase in speed approximately every minute. The first expired minute is referred to as ‘Level 1’ the second as ‘Level 2’ and so on. The end of each level is denoted by a triple bleep. Performers stop running when they can no longer maintain the required pace due to fatigue. The multi-stage fitness test is used as an alternative to the run to assess a performer’s aerobic fitness. Table 5 shows the level and lap (10/3 = level 10 lap 3) required to achieve the various categories on the MSFT. 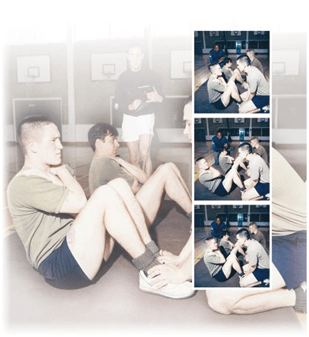 Table 6 outlines the various combat fitness tests used by the British Army. 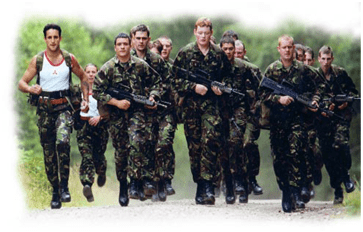 BCFT: The aim of the test is to measure aerobic capacity using a physically demanding criterion task (Loaded March), while accounting for the generic differences in aerobic fitness requirements between each Arm and Service. The test is a measure of basic combat fitness. The test is age and gender free; personnel over 50 years old are not required to take this test. ACFT (1): is based on the physical demands associated with operating in an environment where high levels of aerobic power (speed) are required (e.g. urban patrolling). ACFT (2): is based on the physical demands associated with operating in a rural environment where high levels of aerobic capacity (endurance) and load carrying ability (muscular strength/endurance) are required. Immediately upon completion of the ACFT (1) and day 2 of the ACFT (2), all personnel are to perform a range of RMTs (Table 7) which best represent role-related operational requirements for anaerobic muscular endurance (speed), muscular strength and combat agility for their particular unit. Unaided, climb into and out of the rear of a 4-ton vehicle with tail-board down. Jumping out of vehicle is not permitted and weapon carried or slung. Functional test of upper and lower body strength. Functional test of combat agility and leg power. Fireman’s carry of 100m over good terrain. Carrier carrying both weapons, in a time of 1 minute and with a partner of similar size/weight. Casualty Drag of 50m and on a grassed surface. Weapon slung, in a time of 40 seconds, simulated casualty to be constructed from sandbags (70-75kg) attached to a toggle rope, and both wearing webbing. Scale a standard 2m wall on the assault course. Weapon carried or slung and helmet worn. Functional test of upper body strength, leg power and combat agility. Single Lift of a 35kg ammunition box. Lift to a height of 1.45m, emphasise and practice safe lifting technique with 25kg prior to test, using correct (safe) lifting technique and weapon slung. Weight represents 7.62, 4-bit link ammunition. Height represents loading platform of a 4-ton truck. Carry 2x 20kg Jerry cans 150m. Weapon slung, jerry cans kept clear of the ground and to be completed in 1min 40secs. Fuel/water re-supply and the approx weight of a 2-man stretcher carry with casualty. Perform a re-gain on a single rope bridge and area below re-gain to be soft. Rope height from ground: minimum – 2.25m; maximum – 3m and weapon slung. Functional test of combat agility and upper body strength. Shuttle sprints of 5x20m, in 56 seconds. Carrying weapon. Adopting a prone position at the 20, 40, 60 and 80m marks and wave formation in controlled group. Functional test of anaerobic fitness and muscular endurance using a simulated section attack. Climb and descend a hemp/nylon rope under control. Weapon slung and hands to reach 4m mark. When ordered to do so, leave the water by climbing, unaided, over the pool side or end wall. Pool steps are not to be used. 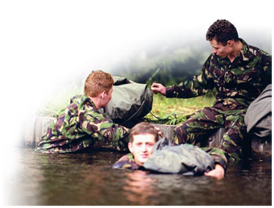 As noted above, the ability to swim is an essential requirement for all Service personnel. However, the ability to manage personal equipment, be self-reliant and have confidence in colleagues’ skills/abilities when confronted by water hazards is an operational necessity. A progressive combat related swimming training programme will give confidence to troops, and identify to commanders personnel who constitute a risk, when training or operations involves water. Details of the CMST are shown in Table 8 below. Demonstrate the ability to create a flotation pack. Pack is to weigh 16kg. Goretex material will support this weight. Enter the water by any safe method and swim 50m with the flotation pack. Wearing Combat 95 or equivalent. Boots and combat helmet are not to be worn. Rifles are not to be used. Any stroke can be used. The packs are to be safely discarded immediately upon completion of the distance. The test can be conducted in any still water. However, temperature, additional safety implications and water purity considerations should be covered within the risk assessment. Training in cold water cannot acclimatise personnel to this environment. Tread water without any flotation aids for 2min. 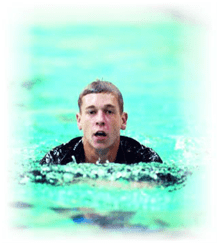 Swim a further 50m without any flotation pack. Royal Air Force (2012) Fitness Tests. Available from World Wide Web: <http://www.raf.mod.uk/careers/applicationzone/fitnesstests.cfm> [Accessed: 12 November, 2012]. Royal Marines (2011) Royal Marines Fitness Tests. Available from World Wide Web: <https://pdevportal.co.uk/assets/upload/ckfiles/kayak/files/RM_Fitness_Tests.pdf> [Accessed: 13 November, 2012]. Royal Navy (2010) Royal Navy Fitness Test (RNFT) Policy and Protocols. Available from World Wide Web: <https://pdevportal.co.uk/pdf/RNTF_policy_and_protocols/RNFT_Policy_and_Protocols.pdf> [Accessed: 12 November, 2012]. Remember these are the minimum requirements. If you are serious then you should be aiming for better than these figures. As an example the last bft I took before I left the army twenty years ago I completed the mile and a half run in 7 minutes dead. Did over 200 push ups and 30 pull ups and 150 sit ups. If they could be verified, your BFT (basic fitness test) stats would be extremely impressive. However, blowing your ‘own trumpet’ in such a manner is unlikely to inspire those who do not have the physical capacity to achieve that level of fitness, regardless of how serious they are. Plus, British squaddies typically use the terms ‘press-ups’ and ‘heaves’ rather than pull-ups and push-ups, which is generally used by the Americans.